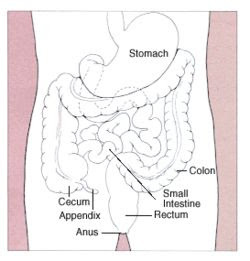 Mark, I think the main thing to note with the appendix is that if she were ever to have low abdominal pain and appendicitis is suspected, you can know (and tell any health care providers) that he appendix is NOT in the usual location. Also, if there is intense pain where you know her appendix is located, you should suspect an issue w/the appendix even though she would not display the normal symptoms of appendicitis/ruptured appendix. Mainly that her pain would not be in the typical place. Make sense?